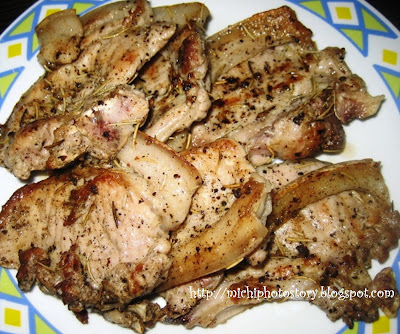 While checking my recipe notebook, I found this recipe “grilled rosemary pork chops”. I’ve got it from old magazine but I can’t remember which magazine. =) I decided to give it a try since I have all the ingredients in the pantry. I was so happy with the result and we both enjoy our grilled pork chop and my hubby suggested trying the recipe with beef. The pork chops are very flavorful and I like the aroma of rosemary herbs. In a mortar, roughly pound the garlic with the salt, pepper, and rosemary. Add olive oil. Spread this marinade over both side of each chop and leave in a cool place, covered, for about 15 minutes. Preheat the griddle pan to very hot and grill each chop for 5-6 minutes on each side. Maybe the grilling part will depend on how thick is your pork chop. It's yummy! Tasty! But wow! It's full of cholesterol... I'm cautious eating the meat particularly pork! I have rosemary plant and haven't tried it yet on pork chop.i will make this recipe within this week .My children loves to eat so they will surely gonna like it. I have that grillpan too, so convenient! I haven't tried rosemary with pork, I always use it with fish...this is one dish to try, thanks! Yummy! Ill try this one when I get back sa Pinas. This is nice for a BBQ party. I should do this on my birthday. Yipeee! Hmm what does rosemary do to grilled porkchop? I have seen it in some menus but I'm curious on the difference with or without rosemary. tess- how i wish i have my own herb plants at home. gene - no problem! sharing is caring. herbert - grilling is healthy. chan - i haven't tried rosemary on fish, i always use thyme. julie - fresh is always better but i don't have one. hehe! joy - yes, i agree. c5 - i can't give up pork yet. hehe! kay - thanks, i will try it next time. palagutom - this dish is so easy you can do this too without sweat. michelle - not sure with tarragon but i'm sure you can use thyme also.